Boil the potatoes and yam in sufficient water until tender. Remove the skin and mash finely. Mix together all the ingredients except oil with mashed potatoes and yam. Knead to a stiff dough and keep aside for 30 minutes. Spread the mixture along the length of the skewers to shape into kebabs. Cook in a tandoor/Oven/Grill for 10 minutes. Remove, baste with oil and cook for another 5 minutes or until cooked. 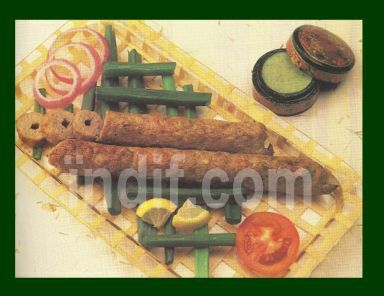 Remove from skewers and serve hot with Green Chutney, onion slices and lemon wedges.